LEXINGTON, Ky. (Aug. 4, 2017) ̶ Today 5-month-old Magdalen Wilson is a peaceful baby who watches her brothers and sisters play around her. But just a few months ago, things were far less calm for the Wilson family of Nicholasville. A serious diagnosis made before the infant was even born took them on a journey that has both challenged and strengthened their faith. Lauren Wilson was about seven and a half months pregnant when she and husband Thom first learned during a routine ultrasound that their unborn child, a daughter to be named Magdalen, might have a congenital heart defect. A second ultrasound confirmed the baby was breech, had an elevated cord pressure and identified a possible coarctation, or congenital narrowing of a short section of the aorta. The coarctation was later confirmed with an echocardiogram and the Wilsons began to prepare for a high-risk delivery in Louisville. 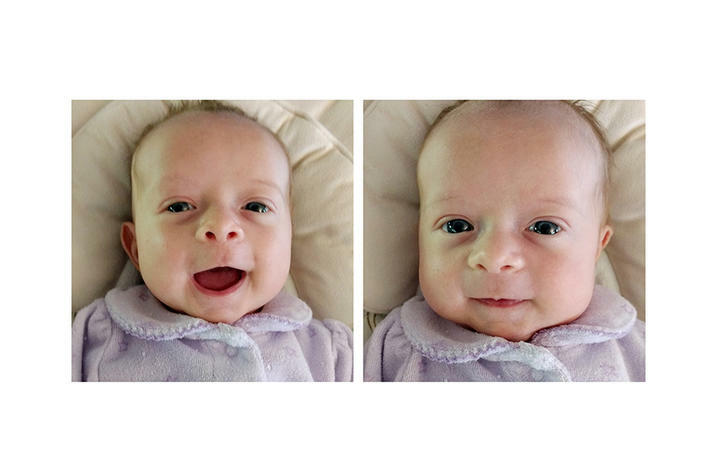 About six weeks later, Magdalen was born just a few weeks early via cesarean section and although the coarctation appeared to cause no problems, an echocardiogram identified several other congenital heart defects. Despite the diagnosis, Lauren Wilson says she and her family remained optimistic. However, things took a turn for the worse when Magdalen was about 3 months old and stopped feeding. 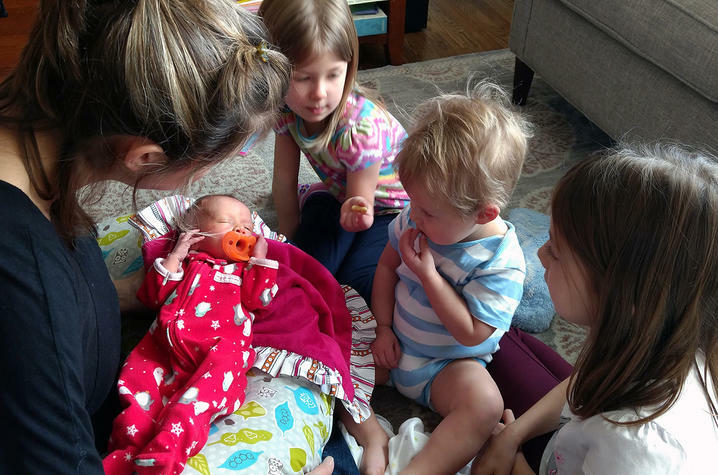 The Wilsons took her to the McKenna David Pediatric Emergency Center at Kentucky Children’s Hospital (KCH) where she was admitted and assessed by the multidisciplinary congenital heart program team. “We made the decision at that point to transfer our care to UK (Kentucky Children’s Hospital) because it was close to home and the doctors and cardiologists we encountered in the Pediatric Intensive Care Unit (PICU) were attentive and showed great concern for Magdalen’s well-being,” said Lauren Wilson. Five days later, Magdalen was discharged with a feeding tube in place and a plan of care for her future, which included heart surgery. On July 5, Thom and Lauren Wilson say they were anxious but hopeful as Magdalen underwent complex open-heart surgery. 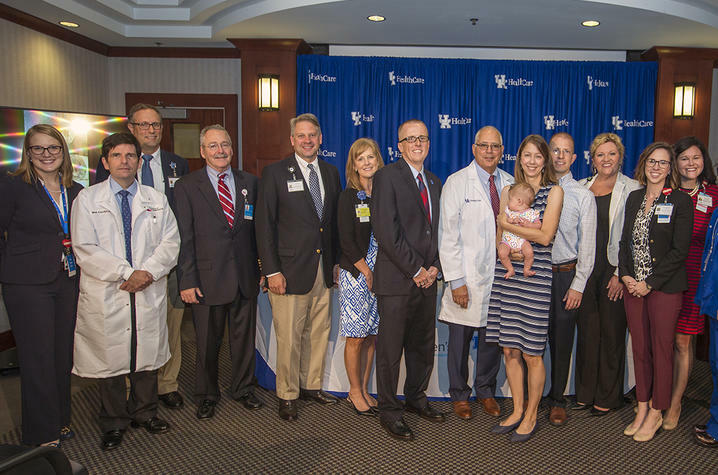 Magdalen’s surgery was completed at KCH since the hospital, part of UK HealthCare, partnered with Cincinnati Children’s Hospital Medical Center to jointly provide pediatric heart care services at Kentucky Children’s Hospital via a “one program, two sites” model. The joint program combines the strengths of UK HealthCare’s advanced subspecialty care with one of the country's leaders in children's health care, Cincinnati Children's. And, for patients like Magdalen and her family, it allows them an opportunity to receive high-quality pediatric cardiac services close to home. Dr. James Quintessenza, a pediatric cardiothoracic surgeon recruited to lead the program, performed the procedure. Quintessenza arrived in the Bluegrass last December after having built a reputation as one of the leading cardiothoracic surgeons in the U.S. He had served at All Children’s Hospital (later named All Children’s Hospital John Hopkins) in St. Petersburg, Florida, for 26 years including 19 of those years as medical director and chief of pediatric cardiac surgery. With the institution of the “one program, two sites” model, patients from Kentucky now have the opportunity to have surgical procedures, diagnostics and therapeutic interventions performed here in Lexington. At all times, recommendations for care are based on what is best for patient safety and quality, allowing families to stay closer to home when appropriate. UK HealthCare officials voluntarily made the decision to pause providing pediatric cardiothoracic (CT) services in 2012 and a task force was charged with providing recommendations regarding the future of the program. Negotiations and eventually a Letter of Intent (LOI) was signed with Cincinnati Children's in 2015 and an agreement finalized in September 2016. While UK HealthCare was working toward the goal of restarting a program to perform complex surgical procedures for pediatric heart patients, it was paramount to be able to deliver the highest quality services. These standards led to the decision to partner with Cincinnati Children’s, recently ranked third among the nation's pediatric hospitals by U.S. News and World Report. Other key components vital in resuming pediatric heart surgeries have been the recruitment and hiring of a world-class program team including pediatric cardiac anesthesia, pediatric cardiac critical care, pediatric perfusion, specialized physician assistants, and advanced practice nurse practitioners, among others. UK HealthCare staff participate in intense on-site training at Cincinnati Children’s while also investing in infrastructure enabling success through telehealth and other technologies, and specialized equipment and supplies. For the Wilsons, everyone in the family is able to breathe a little easier these days and Magdalen is enjoying her freedom and health, said her mother. She is being cared for locally since being discharged after her surgery by Makhoul.